While I did no rides for this trip, I decided I will post about it since it is, in a fashion, ride related connect to the Sverigeleden as it is. Not to mention, I’ve had insistent requests for photos. The company my husband worked for did away with his department this year. After he finished up their current contracts he was left with no work to do though he wasn’t released from his association with the business immediately. They valued him and so wanted time to find another position for him. He was technically still employed, but had no work to do so had plenty of free time. The idea came to us to take a trip. A long one even since we wouldn’t have any absolute deadline. I thought it a wonderful idea and proposed we go to Nordkapp, the northern most point of the Sverigeleden and the northern most point of Europe. Once we decided that, we were on our way in less than two days. Away we went with trike and fishing gear packed as well as everything else people going on a trip would take. As I type this, it occurs to me that both times we have gone into the far northern part of Sweden, we’ve gone in July. The first leg of our trip was up the E4 along the eastern coast of Sweden. It was a warm day though clouds ran through the skies on a brisk wind. This was my second visit to the High Coast. All of Sweden is rising as time passes. The weight of ice from the last ice age pressed the landscape down by hundreds of meters. Since the retreat of the glaciers, the entire landscape has been springing back up and no where faster than on the high coast. It rises by as much as an inch a year. It was a short day’s drive since we’d gotten an unhurried start around 11 am. Once we crossed the High Coast Bridge, we began looking for the camp ground we had stayed in on our first trip. The landscape was gorgeous as we made our search. By the time we were tired we decided to take what we could. Before we set out, one thing we had decided was to not camp so we looked for a place that had the little camp cabins. We found a place that was rather crowded, but along a lake. Best thing about it were a pair of restaurants so we had some choice of what to eat. That was a good thing since our tiny cabin was one room and smaller than our bedroom at home. Not even a hot plate. Just a tiny fridge and a bunk bed with a table and 4 chairs. We took Loke out with us as we strolled along with the crowds to take a look at the restaurants. One was the typical burger/pizza place quite crowded and noisy. That kind of food we could have any where, so we took a look at the one further down the shore. The other was an actual restaurant. An older seeming building that looked wooden and rustic on the inside. A woman playing music. Another section of it was a glass room. They let us walk through with Loke to the deck outback overlooking a Baltic inlet. The food was good. That much I remember though not what I ate. All in all, a nice ending to our first day on the road. We had an earlier start the next morning. After all, the beds weren’t that comfortable and the camp ground didn’t really have too much to keep us there. We continued our navigation on the fly as we continued northward. Jens encouraged me to find points of interest for us to seek out, but I tried to keep that to a minimum or we’d have been zigzagging the whole way to Nordkapp and arrive a month late for our cabin rental. I did have us cut inland sooner than we might have if we’d been following the GPS as I wanted to see at least some places we’d not been to on our first trip north. Admittedly, I don’t remember much of this day’s drive except for the wooden churches and beginning the search for reindeer. In all my years in Sweden, I’ve not seen many wooden churches. Perhaps half a dozen all told. Not too surprising I guess given how frequently churches catch fire. Over a dozen churches I’ve researched have been burned at some point in their history. 3 this year I’ve discovered with recent fires I’ve smelled when I visited them. Not long after the second of wooden churches, we saw our first reindeer. Reindeer always look so scruffy and tattered at this time of year as they’re still blowing their winter coat. The calves look much better and not just because they’re baby-cute, but because they don’t look like they have mange. Loke went nuts at his first sight of a reindeer. The first ones were on Jens’ side of the car and he tried to climb over the rear end of my trike to smoosh his face into the window glass with a whine. Then I spotted these on my side and he bounced back and forth trying to watch both sides of the road at once. We had smears from his nose on the window glass in the back. Too funny. I’m not sure Loke would have known what to do with a reindeer if he got out. The furry one got quite a bit of exercise from that first sighting. Poor puppy. We wouldn’t let him out to play. At some point during the day we rejoined roads we had traveled before on the trip in 2006, somewhere a bit south of the latitudinal line of the Polar Circle. A few familiar landmarks turned up. A shallow stream tumbling over rocks with an old bridge closed to traffic we had pictures of from ’06. At a dam we had also stopped at in ’06 I had a big smile waiting for me. There must have been a dozen people lined up at the rail to take pictures of the view, which while were not what I would call breath taking. All the same, we stopped long enough for me to hop out with the camera. Thankfully, Jens stayed in the car with Loke. I’d taken a couple shots when I heard a meow. Surprised, I looked away from the view to find a cat making a bee-line for me. He passed three other people who called to him to come rub at my ankles. From the car, I could see Loke frantic to get out as I stooped to give the purring cat some attention. He was so sweet, though I’m baffled what pulled him straight to me. I’m glad to have made his acquaintance though. I really do love cats. Especially the ones that love and crave attention. Around supper time, we started looking for a place to sleep and eat. I seem to recall we had a little difficulty until we found a hotel perched on the lowest of the three peaks in the area. They had some beautiful cabins, but dogs weren’t allowed in them, so we had to take a room in the hotel itself. The beds were comfortable and the views gorgeous. Unfortunately, they didn’t have a restaurant on site. However, we were told of a cafe on the highest peak that had a midnight-sun special. So, we hopped back into the car, much to Loke’s dismay and drove higher up. High above the tree line, the parking lot was quite a distance from the actual cafe so we faced a walk. It had felt almost warm at the hotel, but as we stepped out of the car we were hit with a roaring wind and the bitter cold it carried bit deep. Fortunately, we had wisely brought coats, but they were woefully inadequate without thermals and long sleeved shirts. My hair whipped and flew in every which direction. Clouds streamed across the sky and rain veils scattered the broken sunlight into rainbows. Getting colder by the minute we staggered toward the cafe. About half way, I stopped and told Jens it wasn’t worth a cup of coffee and a bit of sandwich or coffee cake. We turned and went back to the car where we blasted on the heat and snuggled down into electric car seats on high. Our search for food took us far down from the mountains into the closest town. There wasn’t much. We ended up settling for sub-par pizza. Day 3 on the road started quite early. We were on our way down from the mountain top before 7:30 and determined to make it into Norway at least. The northern leg of our drive ended up being longer than it might have been since we couldn’t go into Finland with Loke. I’d begun the process of getting his passport, but we had to wait until the end of August for the results of a blood test before he could be cleared to move freely through the EU nations. 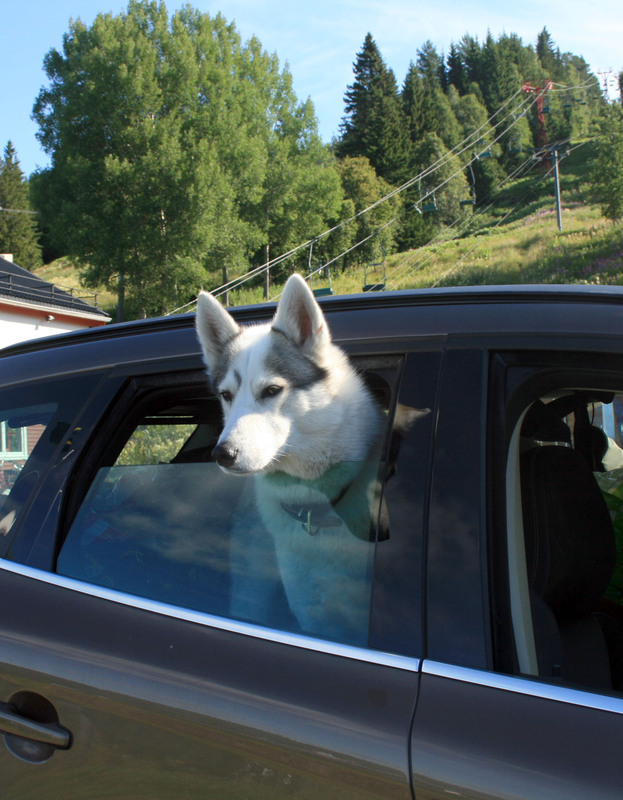 While we could pass freely between Sweden and Norway without a dog passport, Finland was more problematical… or so we thought. So, instead of driving across the small sliver of Finland that stretches over the top of Sweden and northern Norway, we had to drive around it adding over 150 miles (240 km). A couple months later, we found out from a friend of Loke’s breeder that we COULD have done the quick zip through Finland. At the Finnish/Swedish border, they give permission documents to drive directly over the 30 or so miles. It’s just you can’t stop and let the dog out to pee along the way. I almost think I should have called this trip the Rainbow Ride. I lost count of how many we saw. The one in this picture was incredible. It hovered there in the mist rising from a lake. We spotted it in the distance as we drove. I kept waiting it to vanish during the 20 minutes since we’d first seen it until we finally came on a overlook parking spot where we could photograph it. We weren’t the only ones there. Three RV and over half a dozen cars worth of people were there with the same idea we had. Get pictures! We were there for almost 15 minutes and it never showed sign of dissipating. 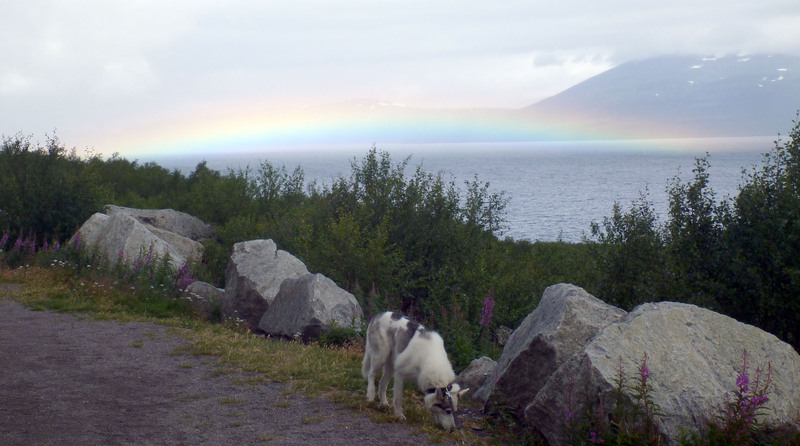 Not long after the rainbow, we finally came to the Norwegian border. We passed through with no problems and soon stopped at a peculiar spot. It had once been a restaurant. A run-down red tin barn looking building with large windows, but that was what not stopped us. It was the giant troll decked out in fishing gear. Though it was the first restaurant we’d seen in ages, Jens told me it wasn’t surprising it had failed being on the Norwegian side of the very close border. It seems that the rate of exchange between Norway and Sweden entices many Norwegians within 60 miles or more of a shop on the Swedish side to make the drive. If the restaurant had been on the Swedish side, it might have flourished. Amazing the difference 2 or 3 miles might have made to this place. A bit after 2 pm, Loke let us know he needed more than a quick stroll around the car for a pee break. We found a tourist spot made up of Sami tents and sheds with all sorts of souvenirs. Jens and I took turns wandering outside with Loke while looking at the shops. The largest yurt had a fire with a reindeer stew and coffee keeping warm. I got brave and bought some dried reindeer ribs. It was okay though nothing to rave about. At least I tried it. Loke on the other hand seemed to think it was wonderful. He sat drooling as I cut each sliver of meat away for him to gobble down. Jens ate some thin Norwegian waffles with brown goat cheese and coffee as we enjoyed scenery and sunshine. You can tell that the border of Norway and Sweden was largely ruled by a change in geography. The entire character of the land changed within a couple miles of crossing the border. The lower, rounded mountains giving way to more rocks and finally the taller, more jagged tops of younger peaks. Just amazing. We made quite a few stops along this stretch. The pretty landscape just demanded to be enjoyed, savored, which is hard to do when you whip by it at 70 mph. By late afternoon, we’d reached the Atlantic coast, though it was a bit hard to tell since the coast line goes north/south by way of east and west. It makes for beautiful views though. Around 5 pm and we found our next overnight place. Yet another hotel and this one at least had a restaurant. It proved to be a stop over for tourist buses full of older ladies and gentlemen exploring Norway. As Jens took care of check-in, I walked around outside with Loke and suddenly found myself surrounded by German men and women gushing over Loke. They simply adored him! We had to leave the furball in the room when we came down supper and over a dozen people asked where our dog was. Would we be bringing him down later? We assured them we would. While the room was comfortable, I’d have to say the food was a bit of a disappointment. It was bland and rather banal. Essentially powdered mashed potatoes with Salisbury steak that put early 1980’s elementary school lunches to shame. I guess they were hoping the landscape would distract their guests from actually tasting what they are putting in their mouth. We went for a walk after the unsatisfying meal, exploring the small village sitting wedged between mountain and water. We wandered along the harbor and then northward to the other edge of the town limits. It took about 20 minutes at a low stroll to make it there and back to the hotel. We left the next morning about the same time as the tour bus. There was one particular German gentleman who was more taken with Loke than the rest of his travel companions. He seemed to enjoy being able to talk with us as he stroked the fuzzy one’s ears. It felt good to get under way again, knowing we were going to get to the cabin that night. Through the morning and early afternoon once we left the hotel, we climbed. Up and up and up. My ears popped every few miles. One thing for certain, IF I do it, Loke won’t be with me. I need another 2 or 3 feet of space when I’ve got him along and I think I’d be mobbed by angry drivers. The daunting thing was, we’d rejoined the Sverigeleden, which goes through Finland. 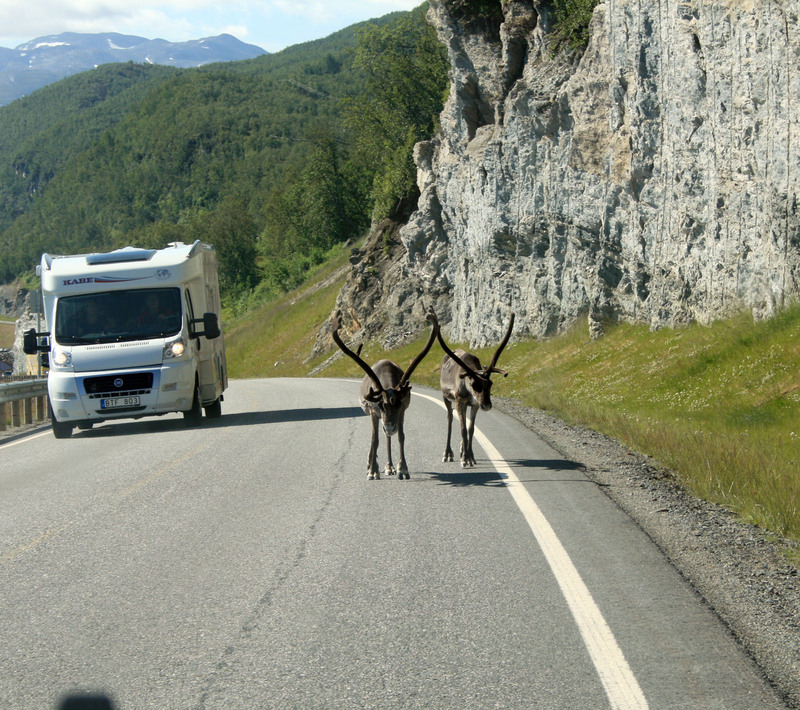 The road took is away from the fjords and I was sad to see them go. The inland views just didn’t have the impact of the mountains and sea. 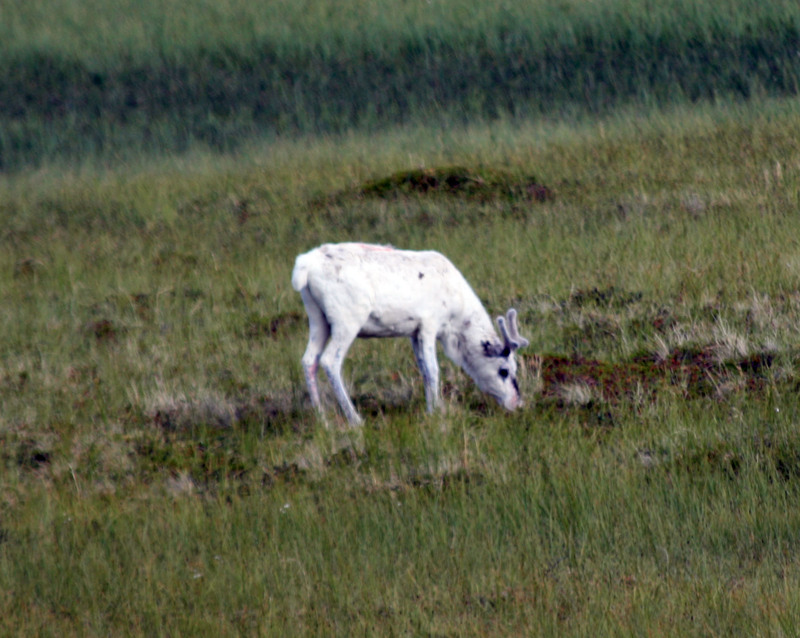 We did start seeing reindeer again which had been scarce since our first few sightings on day 2 still in Sweden. Some of the places we found them were unexpected. A long cliff face to one side of the road and a steep drop to the ocean on the other for miles and there’d be herds of the deer wandering along the road. Migrating I guess, but it made me wonder what was forcing them to the road instead of to the green land above the cliffs. Can’t imagine there was much to eat for so many along that cliff base. We were coming to the northern most point of the Norwegian mainland and after 4 days on the road, I’m sure we all were looking forward to reaching the cabin which would be our base of operations for 2 nights at least. The winding road had dropped back down to the water’s edge again, but on the eastern side of Norway instead of the west. The trees had all but vanished by this point. They were scrubby little things, barely waist high where you saw them. The tunnel when we came to it was a bit nerve-wracking. 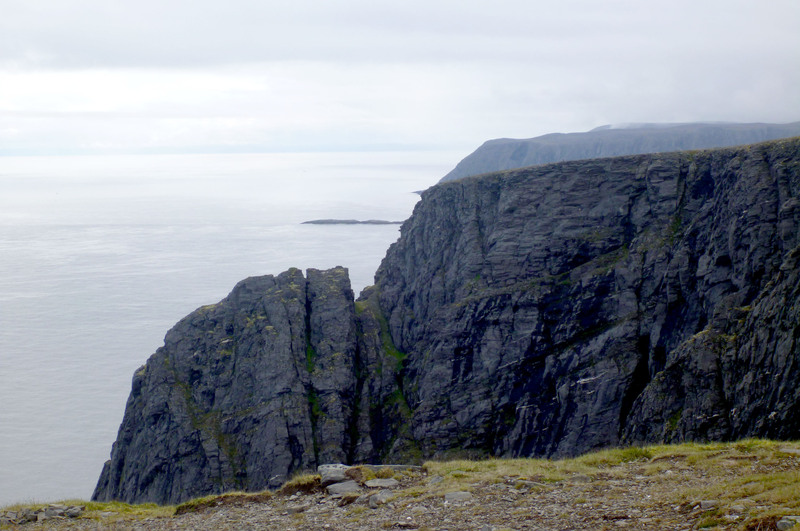 It runs something like 3 miles below the North Sea to the island on which Nordkapp sits. At the entrance, was a siren that went through your teeth like the screech of nails on a chalk-board to keep foxes or even reindeer from entering the tunnel. Then we were out the other side and paying a toll to enter the island and driving through the single town. I expected a tundra environment, but even so the island still looked incredibly stark and barren. The wind blew ceaselessly with no trees to block it and there was a nip in the air. We traveled narrow roads for almost 3o miles and saw not a single car. There were so many reindeer though that Loke finally learned the word. He’d hear it and lurch to his feet and stare longingly out the window. Kind of funny really. Part of the drive to the village with our cabin was barely a lane and a half wide and twisted up a slope steep enough that it made my husband nervous. He’s never been fond of heights. 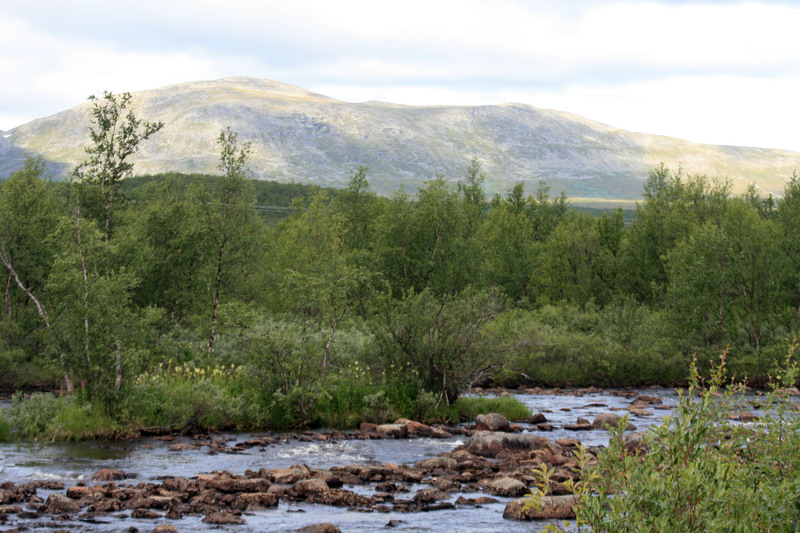 Then we were driving along a long narrow valley with small arctic lakes to either side of the road. Suddenly, the view opened out onto water and islands as the road made a sharp curve and dropped out of sight. As we followed it, we finally saw our destination. A tiny village with a year round population of 140 people. Quickly we found our hosts. They were an incredibly nice family though we never met the man. His wife and their 18 year old son were welcoming. Our cabin was a small apartment built over a garage. Though small and with the ceiling too low in the sleeping area for Jens to stand upright, it was still charming, warm and comfortable with a beautiful view across the village harbor. I think the restaurant was closed, but we had some pretty decent food just down the stairs from our cabin door. The cabin owners also ran a little fast food trailer. The burgers weren’t bad, but the fish and chips they had were as good as anything I’ve ever had before, even the fish and chips in England when we went to try out my Trice. We pitched our luggage in the cabin before jumping into the car to find Nordkapp. The clouds were thickening and growing lower as we drove back to the main road and turned north. We drove on through the worsening weather as the horizon vanished in the thick gray mists. We found an entrance fee for Nordkapp, but decided it would be silly to pay it with such poor visibility. But we had made it! One of the clearest starting points of the Sverigeleden. The very northern tip of a north-south leg. Not an arbitrary starting point in the middle of a loop. And we saw a lot of cyclists too, all loaded with gear and stubbornly chewing their way up the steep slopes. It tickled me pink! Apparently, in spite of the fact that the trees don’t even reach 2 inches off the ground, the ecosystem has everything that qualifies it as a viable forest. That is so neat and I’m glad I actually found it. We walked for about half an hour before returning to the village for a good night’s sleep. The beds were WONDERFUL! I also have to say it was one of the quietest night’s I’ve ever had. No traffic, no sirens, no people yelling, not even dogs or cats. Just the soft twilight that serves as night during the far northern summers and silence. I slept like a baby. I woke the next morning and found the weather had cleared slightly. Oddly, I really had no impulse to ride my trike. I felt too daunted by the hills. I wanted to see more than the 5 miles I MIGHT have been able to climb in several hours with the trike. Once Jens had stirred and slurped a bit of coffee, we decided to go back to Nordkapp. The way was clear and we payed the fee and went in. The place was packed! Over a dozen tour buses, too many RVs for me to bother counting, quite a few cars and even a few motorcycles. We walked past the square block of a building to where the land ended in a sheer cliff, giving way to an endless stretch of sea and clouds. We went to the edge, me a little closer than Jens did, and stood on the brink of Europe’s end. There was nothing but water and ice between us and the North Pole. Granted, miles of it, but still! It was exhilarating! As we walked around, we became the center of attention. Oddly, everyone was drawn to us. I should be more specific, I guess. They were drawn to Loke. I guess the tourist trap inside the building and the stunning views could only hold their attention for so long, so we were mobbed. Men and women from Poland, Germany, France, Italy. It was like the hotel on the harbor x10. Even a woman with her child from Greece. She gushed over the furball, saying how much she missed her own dogs at home. I think over 100 pictures of Loke were taken. Loke’s behavior was stubbornly aloof. He didn’t want to greet any one. He wouldn’t look at cameras. When we’d stop so someone could pet him, he would just sit and look anywhere but at the people. I guess there were just too many and he was trying to avoid any eye contact. Jens left me to go look at a globe structure and the inside of the building before giving me a turn. I’m pretty sure they wouldn’t want Loke wandering around in there. I walked around to the front of the building and found an elderly gentleman sitting in a wheel chair. I guess the building wasn’t entirely wheelchair friendly and those with him and gone to take a look inside, leaving him alone. He looked a bit despondent. When he saw Loke, his eyes brightened a little so I walked over with a smile. With him, Loke was a little warmer, though careful. He put his head on the old man’s knee and wagged his tail when the gentleman stroked his head with arthritic swollen hands. He was smiling as he took a picture of Loke. I was glad to have brightened his day even for a few moments. I was only too glad to leave the sheer density of people behind when I’d finished looking through the tourist shop. I’ll admit there were a few nice, high end things in there, but nothing I was really interested in buying. One thing I really wanted to do before we left the island was to take a boat tour out to Bird Island. That decided we returned to our cabin, where our hosts also ran said boat tours. Actually the little village hosted two tours. One was on a very large boat to accommodate the tour buses that came and then our hosts who had a much smaller boat which could take groups only up to 7 people. Sometimes, they got overflow from the bigger boat. I was a bit disappointed that Jens wouldn’t be able to come since someone had to stay with Loke. Much to our surprise, our hosts said that if no one else showed up for the 3 pm tour, they were fine with Loke coming along. The weather deteriorated slightly as 3 pm came. Nothing truly bad mind you. Just grayer with thicker clouds. No one showed up! So, we payed the fee and we wrestled into survival suits. Just Jens and I. Loke walks around with his survival suit and Björn, our hosts’ 18 year old son, didn’t seem to think it necessary for his well being. In moments, we were motoring our way along the harbor and through the twisty channels between the docks and open water. Loke did amazingly well! I hate the fact that I didn’t think to take a picture of him. When the boat was going slow to medium speed, Loke was sitting up and looking around, peering curiously over the side. When Björn poured on the speed to hurry us to Bird Island, Loke decided he didn’t like that too much. He hunched down on the floor and tried to wedge himself between the front seats, as far from the motor as he could get. Out on the open water it was rougher and at high speed, the boat skipped across the waves as the bulk of Bird Island and the smaller islands rose before us. As we got closer, Björn slowed us down and we were surrounded by birds. Puffins were everywhere, their bright beaks and stubby wings giving them a comical air. The way they sort of frog hopped across the water, slapping at it with their wings only made them more adorable. The other birds had a little more dignity, but I loved the puffins most. Once the boat slowed, Jens had to keep a good grip on Loke because he was entranced by the puffins though for an entirely reason. He was ready to leap over the side and go after the skipping black shapes. As Björn motored us around, sometimes within arms-length of the rocks, I discovered an annoyance with the cloud cover which had thickened since we’d left Nordkopp. On the tossing waters and with the poorer light, the shutter speed on my camera was too slow to make sharp images even with the stabilizer. It didn’t stop me from trying though! Looks Like Common Gulls, But They're Kittiwakes! 3 million or more birds come to this island every year to breed. The noise was incredible and look up to see the black specks against the sky was like looking at a swarm of bees. 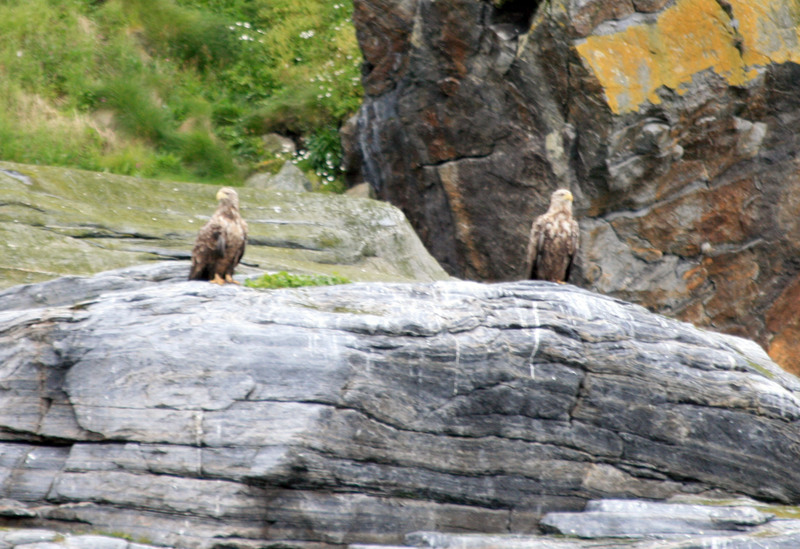 The island had a resident pair of sea eagles, but as many as 20 more come with the sea birds. Puffins, kittiwakes, gannets, cormorants and auks. Björn cheerfully pointed out the ropes that are used to reach some of the birds’ nests to gather eggs. He told us how a man and boy would go up, then a rope would be tied around the boy for him to be lowered down to gather the eggs before being pulled up by the man. He gave a big grin and said he’d always been a sturdy boy and too heavy to go over the side. I would have thought I’d be appalled at the idea of anyone hunting the birds’ eggs or even hunting the birds themselves, but I wasn’t. There weren’t many people who lived on the island year round and Björn made it clear that what they took from the island was no more than they needed to survive the winter. For their own use, not to be sold like the fish from their boats that went through the village’s tiny packing plant. I wouldn’t be nearly as unruffled by the idea of hunting the birds if thousands of people descended on the island every year, each of them killing thousands to sell the beaks or something silly. Björn was quite eager to hear about the U.S. as well. He wanted to travel to the U.S. at some point and one thing he really looked forward to was eating at Kentucky Fried Chicken. Delighted, I laughed and told him if he went to the southern part of the U.S., he should try Church’s too. I hope he gets to go. He had spent his entire life in the tiny village. I don’t think that’s a bad thing. Life sounds a bit harsh there, but I imagine there’s a certain amount of peace as well. Of course, peace is probably the last thing an 18 year old guy wants! It was thrilling to be out on the rough waves of the open water and Björn knew the limits of the little boat. He put almost into a shallow cave at one point and quite close to rocks. I was happy our hosts had the boat tours as well. I don’t think it would have been nearly as fun on the big boat restricted farther out to deeper water. Not to mention, I tend to get sea sick on ships and large boats. The small ones I have no trouble at all with. In December 2005, Jens and I went up into the northern part of Norway by train to go watch orcas in the fjords. It was an interesting trip, though we only saw the whales for 10 min when the light was too dim to take pictures of them. When I was on deck in the bow, I was fine though the waves were 10+ feet high. Being on the boat was like being on a roller coaster. As full dark came, I went below deck and got so sick. It didn’t go away immediately when I left the boat either. I was even still nauseous the next morning. So, yeah, I prefer small boats. Hehe. We’d been out for quite a while when Björn told us we should also keep an eye out for seals. Less than 10 minutes after he’d mentioned it, I was looking along the wave frothed rocks. I blinked and then looked harder. One of the smaller rocks had vanished. Jens and Björn were talking as I scanned. I gave a laugh as I saw a sleek dark head come up with a toss, flinging a fish to tear the flesh. I only too happily pointed out where I’d actually seen the seal as I hurriedly readied the camera. The guys finally saw the seal as it bobbed up, just a round, dark dome with black eyes and nostrils. 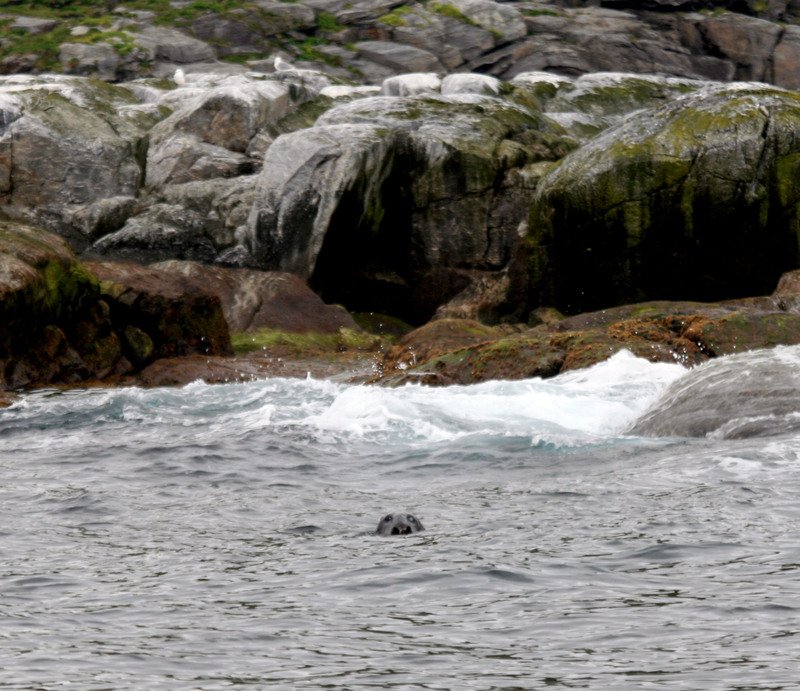 We saw a few more seals around a small clump of rocks and then we were skipping back across the waves to the village. Fun as it was, it felt good to peel out of the survival suits, buy some fish and chips and slouch on the couch for the rest of the evening. I was a bit sorry to be packing the next morning. I really enjoyed our visit to the island and was sorry to be leaving it so soon. We took one last walk through the village to get Loke to do his business before we got under way. I’ll admit to feeling a tiny bit peeved by the fact that the skies were almost completely clear and the sun shone brightly. Of course, our hostess pointed out that people don’t come to Nordkapp for the weather. That’s quite true. Too soon we were driving our way back the way we came. Our initial plan had been to take a different way back through Sweden, finding things and places we might want to see. Honestly, we were both too tired to think about it. Instead, we began rushing toward home. It’s amazing how much faster we were going back. We crossed the border into Norway before we found a place to sleep that night. It turned out to be the same resort we’d stayed in during the whale watching trip. Resort in Sweden and boat in Norway. The beds were ‘ehh’, but we were both tired enough to sleep deep. The mad dash continued the next day, through good weather and bad. Some quite bad rain at some points actually. Somewhere around Jökkmökk, Jens asked me to drive. He’d been a sweetie and done all the driving up to that point, freeing me to enjoy the scenery, navigate to points of interest and take pictures. Pushing as hard as we were and over ground we’d already driven across earlier in the week, Jens was tired enough to ask me to drive some. I managed to get us to Sweden’s eastern coast and a bit of the way down before I started to flag. After a bit of a nap, my hubby was able to take back over. By the time came where it was late enough to look for a place to overnight, we were back in the High Coast. It felt down right silly to stop less than 4 hours from home. We pushed on. Somewhere along the way in the deepening twilight, we passed a recumbent trike! It was way too dark for me to tell what model, but it was definitely a ‘bent 3 wheeler! I giggled happily. I do think he was a mad man to be riding on that section of road in near dark though! We staggered through the door and into our own bed around 2 am with wonderful memories of an incredible trip. Even if we didn’t cycle or fish! So, here’s the post about my journey to the furthest northern point of the Sverigeleden and Europe!